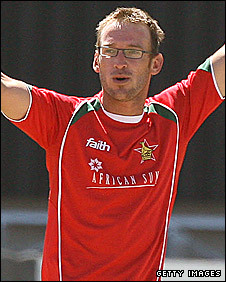 Charles Coventry equalled the highest individual one-day international score but could not prevent Zimbabwe losing the series against Bangladesh. Coventry fired an unbeaten 194 from 156 balls to equal the total set by Pakistan's Saeed Anwar in 1997. But with his Zimbabwe side managing 312-8 from their 50 overs, Bangladesh reached 313-6 with 13 balls to spare. The win gives Bangladesh an unassailable 3-1 lead in the series with one match still to play. Coventry fired 16 fours and seven sixes as he equalled Anwar's feat with his maiden international ton. "Well done to the Bangladeshis for the way they chased," said the 26-year-old. "We'll be out there trying the hardest the next time." However, there was little support from his colleagues, Stuart Matsikenyeri's 37 the second-highest score. Zimbabwe skipper Prosper Utseya said: "The innings of 312 wasn't enough but our game is improving. "We're playing international cricket and we missed chances that should have been taken, 3-2 sounds better than 4-1 and we need to come back strong and play well for the fans." For Bangladesh, Tamim Iqbal led with way with hit eight fours and six sixes in his 154 before being dismissed by Ray Price, who took three wickets. Mahmudullah saw the tourists home with an unbeaten 21 from 11 balls. "Tamim batted magnificently, can't get better than that," said Bangladesh captain Shakib Al Hasan. "We played very good cricket against West Indies and this series too, everyone chipped in but we need to improve our fielding." The final game of the series also takes place in Bulawayo on 20 August.